Glo introduces a new data bundle plan that works on all device. Though its a promo plan but we pray this promo last long. From their page, they states, 'We got really good news for you! From tomorrow 23rd January 2014, you get twice the value when you subscribe to the "My Phone" Glo Bolt Data Plan.' This actually means that instead of getting 800mb for N2,000, you would be given double at same amount, that is, 1.6GB for N2,000. To get started, simply text 55 to 127. This bundle could be shared or gifted out. 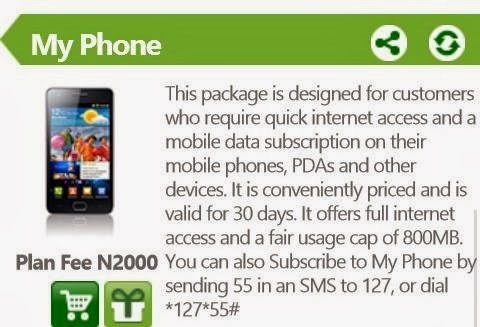 Hope this helps some smartphone phone users, but seems like airtel still remains on same track with N1,500 for 2GB, well it's your choice to make. nonso pls email me the mtn simple server 2ma email pikios5050@gmail.com,just saw ur twitter msgs now.Biko eji m chukwu ayo gi tanx. @Codedtinz Chiboy can you tell me which hack is still rocking presently I tried the etisalat simple server trick isn't quite working. Can you paste a number I can caontact you onn caus I need personal guidance on how to configure these hacks.